I have always made an effort to buy my wife flowers. Not for anything in particular just because I love her and I know she loves to have flowers in the house. I don’t spend a lot as I don’t think that matters unless maybe if it is a special occasion. Something else I rarely do is get the flowers delivered! One such occasion is when I buy mothers day flowers. My mum is no longer around to receive mothers day flowers but it’s only right that the boys get their mummy some lovely flowers. I have never ordered flowers online before. Closest I have come is ordering from a local florist but thanks to Appleyard London I have got MrsDWB a lovely bunch of flowers. Delivered fresh and fast. I must say I am very happy with the flowers we received. Not only were they kind enough to help me out they also want to help you out. If you order any mothers day flowers and use the code below you will a whopping 40% off! 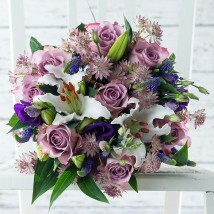 Just go onto the site at www.appleyardflowers.com, order one of their great selections and use the code at check out. (Excludes ‘flowers by post’ range). So if you want next day flowers, then check out Appleyard London and save some money in the process.